Last week we heard some of the history behind Chinese gardens and some of the different types of gardens. Imperial gardens are on a vast scale with a lot of pavement, very old and gnarled trees. Monastic gardens were more like a parkland with areas for growing food. But what about real Chinese gardens for ordinary folk? Today we continue with part two of what makes a Chinese garden and you’ll probably want to know how you can create one yourself? ﻿﻿﻿﻿There are some things you already might associate with Chinese gardens like Lion statues and water features, but what are the elements that make the difference between Imperial, Monastic and residential Chinese gardens? Louise Brooks interviews Peter Nowland, landscape architect with Sydney Foreshore Authority, and horticulturalist, Andrew Meade in part two, Chinese Gardens. ﻿﻿﻿To create a Chinese garden you have to have water, rocks and of course plants. Water is the giver of life and the Ying or female part of the garden. Then there's the rock or Yang-the masculine part of the garden. rock in China is usually limestone, but you can use rock that's endemic to your region, such as granite or sandstone. The plants are specific, for longevity, luck and wisdom. So many elements that you can add to your garden from zig zag bridges to stop negative energy, to thinned out bamboo to create a bamboo forest rather than just a solid dense clump of bamboo. What about some cloud stones at the bottom of bridges and pavilions, or in our case a pergola. Cloud stones are to lift you up as if you were standing on a cloud? Lotus flowers are of course is about symbolism of life but you would need a rather large water feature to fit them in. Today’s vegetable is loaded with carbohydrates or carbs as we refer to them. Why am I talking about carbs? Because a new study showing a high carbohydrate, low protein diet can help you live fifty per cent longer has just been released from Sydney University. But first a question.Ever heard of arrowroot as in arrowroot biscuits perhaps? Did you know Arrowroot is actually a plant and not just the name of a type of biscuit? The scientific name of the type of arrowroot that I’m talking about today is Canna edulis but it’s known as edible canna and Qld arrowroot. There are other types of arrowroot, but generally not available to buy or grow in many places in Australia, so I’ll stick to the Canna edulis one. 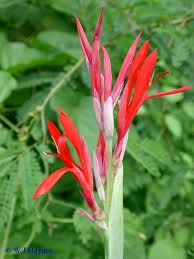 Some of you might know that Canna plant already, with its sword shaped leaves and brightly coloured flowers. Well arrowroot is an edible canna. In fact it reminds me a bit of edible Ginger or Cardamom because it’s a very hardy, clump-forming perennial plant with thick stalks and large bright green leaves 300-600mm long to 2m high. But which part do you eat? 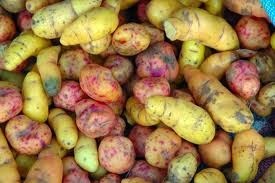 In this case, like the edible ginger, you eat the tubers. If you dig them up when they’re small - about the size of a tennis ball and the skin is still white is the best time. They can be used all year round, as a potato substitute. ﻿﻿﻿﻿ HINT: Another good thing about Arrowroot tubers is that you can plant them at any time of the year. The large round red rhizomes can be eaten raw, cooked as you would a potato or used as a flour and thickening agent. Young shoots can also be eaten as a green vegetable. 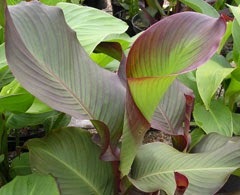 Edible Canna is easy to plant, to grow and to harvest. While the tubers grow at a rate of knots, in deep rich friable soil, they are the most hardy of all the tuber crops and grows well in any type of soils even where most other tubers refuse to grow. You can start digging the tubers up USING A GARDEN FORK after 6 months usually around Summer and Autumn. In fact if you had planted a tuber last Spring, you would’ve had a clump about 1 metre across by now. SO HOW DO YOU GROW ARROWROOT? Even though the books will tell you that Arrowroot needs a warm sunny position; Arrowroot will tolerate heat and light frosts. Suitable for temperate, subtropical and tropical areas but there’s no reason for you not to try it in Gippsland or even Canberra, just not out in the elements. An idea would be to plant it under a shrub as protection from deep frosts. Arrowroot can be grown in any soil even clay soil because it likes moisture and even copes with poor drainage. Full sun is the key, so even though I said shelter it from frosts under a shrub, the position has to be north facing. ﻿﻿ Of course if you add compost, manures and all those great organic fertilisers you have in that garden shed, you’ll get fast growth and lots of tubers. One other thing, if you’ve got poor sandy soil, don’t forget to keep up the watering. Edible canna or arrowroot does develop small orangish flowers that will set black seeds. If you live near a watercourse or creek, there’s potential for the seeds to spread into bushland or along creek-lines, so do cut off the flowers as they finish, and definitely cut off the seed heads. HOT TIP: seed grown plants are slow to mature and vary in the type of plant you get. It’s faster and better to divide your plants if you want to give some to other gardeners. 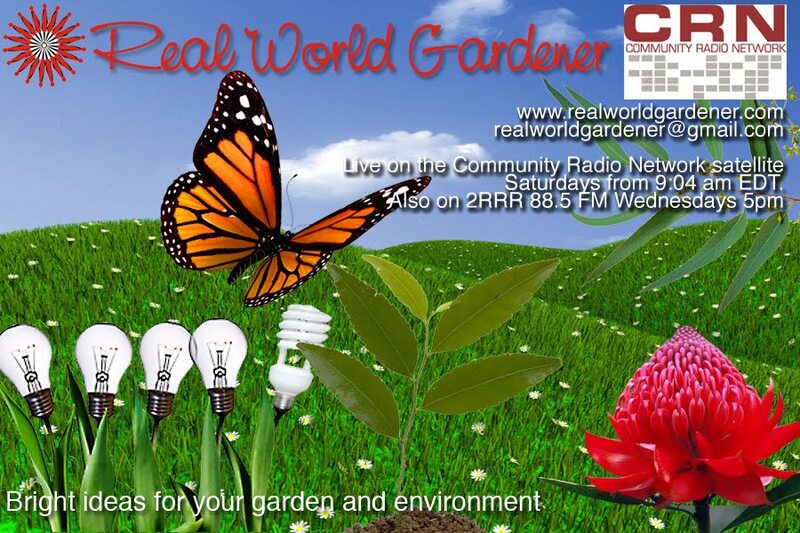 TIP: If you can grow Cannas you can definitely grow edible Cannas and arrowroot has few problems with pests and diseases. As mentioned arrowroot is starchy and can be eaten like potatoes. Digging them up when they’re small is the best because as they get older they become dry and stringy. Just peel them like potatoes and soak them in water if you want less starchiness. Freshly grated arrowroot can be used as a thickening agent. By the way, unlike potatoes, unless you’re thinking of making arrowroot flour, which is a longer process than I have time for, you need to dig up your tubers and use them soon after. Excellent carbohydrate, the starch is easily digested and is a promising food source. Arrowroot also has 10g of protein for every 100g of tuber. But apart from the carbs and its use as a thickening agent, and extracting arrowroot flour, there are no vitamins or minerals in this plant. So back to that study, Sydney University research found mice fed a high carbohydrate, low protein diet had a longer lifespan and better cardiometabolic health despite the fact they were overweight. I recently spoke to Professor Steve Simpson who conducted the study, and his suggestion was that a diet that consists of 15-20 per cent high quality protein, low in fat and high in good quality carbohydrate will deliver the best metabolic health and longest life. No need to cut out those carbs, just the fried chips. The Araucariaceae family of trees has been described as both ancient and bizarre. This group is one of the most primitive of the world’s trees. 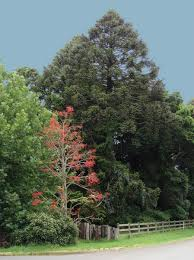 There are only three genera, Agathis, Araucaria and the newest addition Wollemia (the Wollemi pine). Did you know that Australia is the only place with all three genera? Have you heard of a pine tree that grows in the rainforest? Not heard of anymore in the northern hemisphere but common in rainforests in Australia and New Guinea. But there’s more, the nuts are edible! 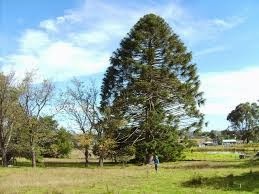 The Bunya pine is a beautiful ornamental pine tree. If you’re growing an Australian conifer, then don’t go past a Bunya nut. Although it’s a rainforest tree, it seems to be pretty adaptable with reportedly trees growing in Hobart, Perth and in various botanic gardens and parks in the northern hemisphere. Even in Canberras botanic gardens there are trees over a hundred years old. Canberra of course experiences a wide range of temperatures. The Bunya Pine (Araucaria bidwillii) is a large tree, growing 30-45 metres in height, with a straight, rough-barked trunk and a very distinctive, symmetrical, dome-shaped crown. I've heard it described like looking like the back of a shovel. 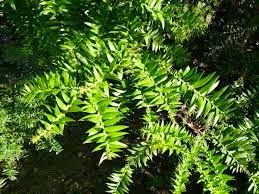 The downside of this tree is that it’s got very sharply pointed, lance-shaped leaves, about 2.5cm long, which make it uncomfortable to be around if barefoot, as it drops twigs and leaves quite often. The Bunya Pine has one of the largest cones of any conifer. The kernel of this nut is a pale beige colour with a firm but waxy texture which some say is sort of like the taste of raw macadamias. I’ve seen cookbooks which is like a 1001 ways to cook with Bunya nuts. A council sign in the town of Vincent reads. 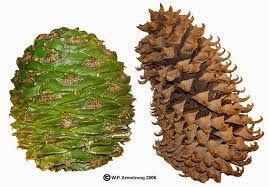 Bunya pine cones can weigh up to 10Kg. Signed the chief executive officer. You heard that Bunya nuts are the size of a 50 cent coin and each cone can have 50 – 100 nuts and might weigh up to 10Kg. It’s safest to collect cones that have fallen to the ground and rolled out from under the trees. Otherwise make your harvesting run under the trees very quick not when the wind is blowing, and preferably with a hard hat!